Yesterday, as I watched a very special episode of "Perfect Strangers," Cousin Larry went a little too crazy shooting a film about Balki's life. 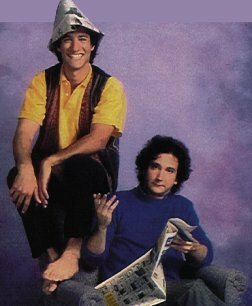 Then, Balki explained why replacing their friends with actors was wrong, and Larry learned the true meaning of friendship. Unlike Balki and Cousin Larry, most of the people I know actually work in the film industry. Next weekend, I'm doing a project where I replace all those people with friends. I'm hoping when things go poorly I'll learn the true meaning of acting.